The microscope, a crucial tool in many disciplines including biology, geology and material science, offers new perspectives to scientists. Many scientists and students need to understand the mechanism and use of microscopes. Microscopes work by expanding a small-scale field of view, zooming in on the microscale workings of the world. Microscopes enlarge, or magnify, the image of an object. Light microscopes combine the magnification of the eyepiece and an objective lens. Calculate the magnification by multiplying the eyepiece magnification (usually 10x) by the objective magnification (usually 4x, 10x or 40x). The maximum useful magnification of a light microscope is 1,500x. Electron microscopes can magnify images up to 200,000x. Magnification on a microscope refers to the amount or degree of visual enlargement of an observed object. Magnification is measured by multiples, such as 2x, 4x and 10x, indicating that the object is enlarged to twice as big, four times as big or 10 times as big, respectively. For a standard light-based microscope, the maximum magnification extends up to 1,500x; beyond this, objects under view become excessively fuzzy because the wavelengths of light limit the clarity of images. Electrons, on the other hand, have much shorter wavelengths. According to Auburn University, electron microscopes produce useful images with magnifications up to about 200,000x. The magnification on a microscope must be adjusted carefully in proportion to distance. For optical microscopes, the higher the magnification, the closer the lens must be positioned to the object being observed. If the lens gets too close, it may crash into the specimen, destroying the slide or specimen and possibly damaging the lens, so exercise great care when using magnifications over 100x. Most microscopes allow for adjustment of the lens-object distance, as well as providing preset default positions that place the higher magnification lenses closer to the slide. Measure the magnification of a microscope by placing an object of known length, such as a ruler, beneath the lens and measuring the degree to which the microscope enlarges the image. Use a similar procedure to get an idea of the scale of any magnification by putting a ruler or another familiar object, like a dime or paperclip, underneath the lens with the object on the slide. 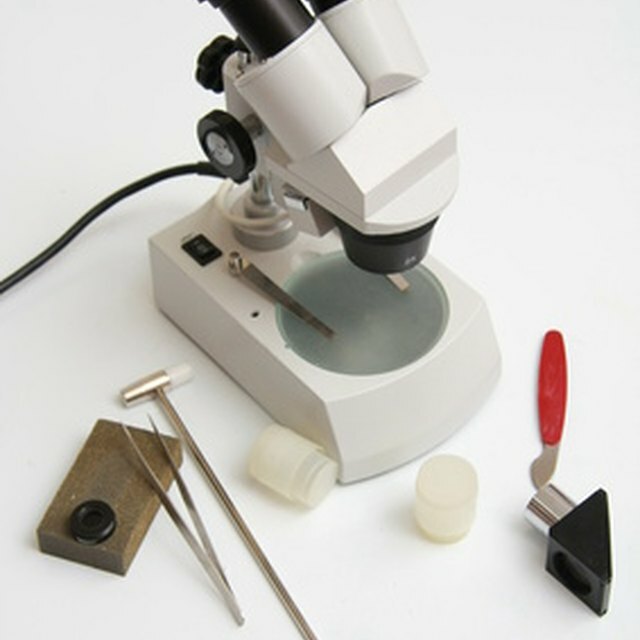 Looking through the microscope, compare the observed object with the relative size of the ruler or other known object. Again, be very careful when using the higher power objective lenses to avoid damaging the slide or the lens. The magnification adjusts through combining the eyepiece and lenses of most microscopes. The standard eyepiece magnifies 10x. Check the objective lens of the microscope to determine the magnification, which is usually printed on the casing of the objective. The most common objective lens magnifications for typical laboratory microscopes are 4x, 10x and 40x, although alternatives of weaker and stronger magnification exist. Calculate total magnification by multiplying the eyepiece magnification by the objective lens magnification. Typical laboratory microscopes magnify objects 40x, 100x and 400x. White, Joe. "What Is Magnification on a Microscope?" Sciencing, https://sciencing.com/magnification-microscope-5049708.html. 02 May 2018.